To try out the neon fashion trend, I purchased a cheap playsuit last year. I had planned to wear it with cropped t-shirts over the top, although, it didn't work as well as I had hoped, and so I decided to make a more wearable piece for my wardrobe by altering the suit into shorts. 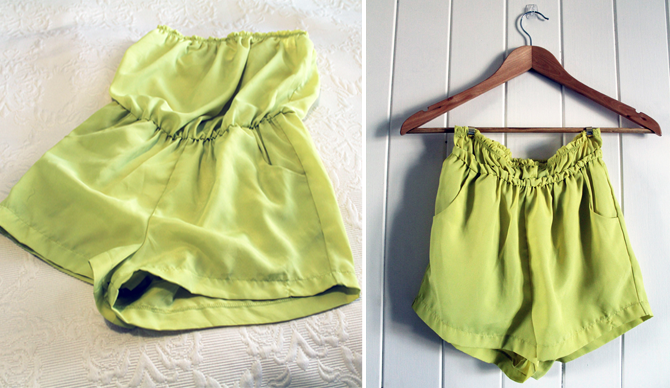 Rather than nip and tucking to make these shorts, I simply tucked… the top half into the bottom half (keeping the elastic at the top) and added a few tacking stitches to keep it all in place. This way, if I decide I want the playsuit after all, all I need to do is unpick the stitches. So clever! I remember when you bought this playsuit (I think). And the pants look amazing!! :) job well done I say!